Between my dog and my child, I can’t decide who is more of my spirit animal. Sadie (my 8 year old cocker spaniel) spends her days eating, napping, laying around, and silently begging for cuddles. That’s my aspirational spirit animal. Nora Beth spends her days napping, eating, dreaming of “CHEEEEEEE CHEECHEECHEE!!! !” (cheese, of course… give that girl some dill havarti, smoked gouda, white cheddar-gruyere, she doesn’t have any time for a Kraft single), receiving many a “smoooooch” and cuddles and talkingomgnonstopneverstopstalking. Since our trip to My Gym last week, she has been physically requesting forward rolls on the hour and attempting them on my own. She is my actual spirit animal and my favorite creature on planet earth. Mealtime is both of our favorite times, and like-mother-like-daughter, do not ask us to smile or answer a question during the first 2/3 of our food consumption. We’re busy. Here’s what we enjoyed on our plates last week (spoiler… it was a really scrumptious week)! Avgolemeno – This quirky little soup was a big hit all the way around our table. It’s quick and simple, and bizarrely and shockingly tasty. This is a definite make again for our recipe rolodex. Garlicky Greens & Sausage Penne – I love the Foodess’s blog. 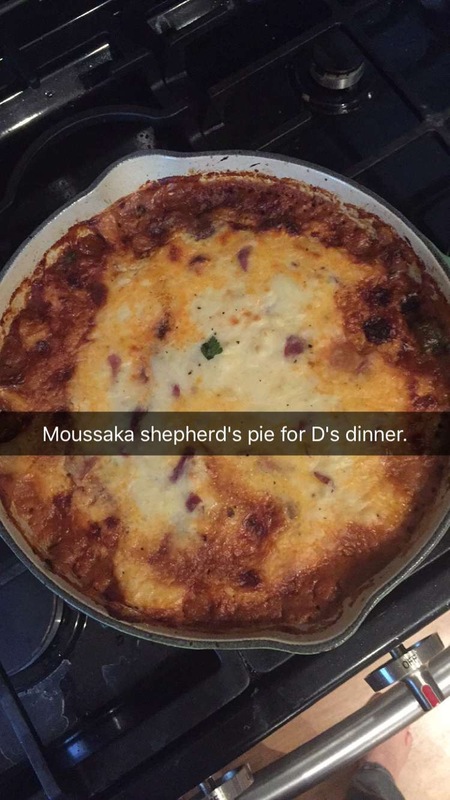 Our favorite Samosa Pie is from her site, and my new favorite dish that I’ve ever made (mentioned below) is also one of hers. This was another simple meal that hit the spot and packed a punch of flavor and the power of greens (I used a combo of kale and rainbow Swiss chard). I used some ground sausage that David made. Nora Beth loved this pasta too. Moussaka Shepherd’s Pie – Beyond words. This is my new favorite thing I’ve ever made. Ever. The recipe calls for ground lamb, which I adore, but I wanted to save some dollars and make do with what I had on hand. We had ground bison in the freezer, which I used, and it turned out great. I can imagine the lamb would take it over the top, but I think any ground meat would yield delicious results. Nora Beth SCARFED this down. I mean to tell you, she went nuts for it. My mashed potatoes turned out a little runny, but it was no problem. After the pie baked, I popped the oven to Broil for 3 minutes, and boom, golden. I will make this again and again and again and again. Chicken Paella – I love paella. It’s such a hearty comfort food. It would have been more delicious with the addition of shrimp and andouille sausage, but I had chicken thighs on hand, and therefore, chicken thighs are what I used. I burnt some of the rice, but truly, this is a fool proof, one pot meal that makes a TON.